Our SSSS Tips are prepared by a group of analysts, using the best information in the country, all our sources, as well as relentless video analysis. We consistently beat the bookies with our overlays. When was the last time you WON over 50 units in a week? Our exclusive Bad Day Guarantee will provide you with our rated overlay runners for the next day's racing if we record a losing day. This information is GOLD and is our way of trying to help you beat the bookies in the event of a losing day. As our rated prices often reflect the eventual market price, this gives you the opportunity to snap up some bargains before the professionals snap them all up the next morning. Our Bad Day Guarantee only applies to our Active Punter subscribers. 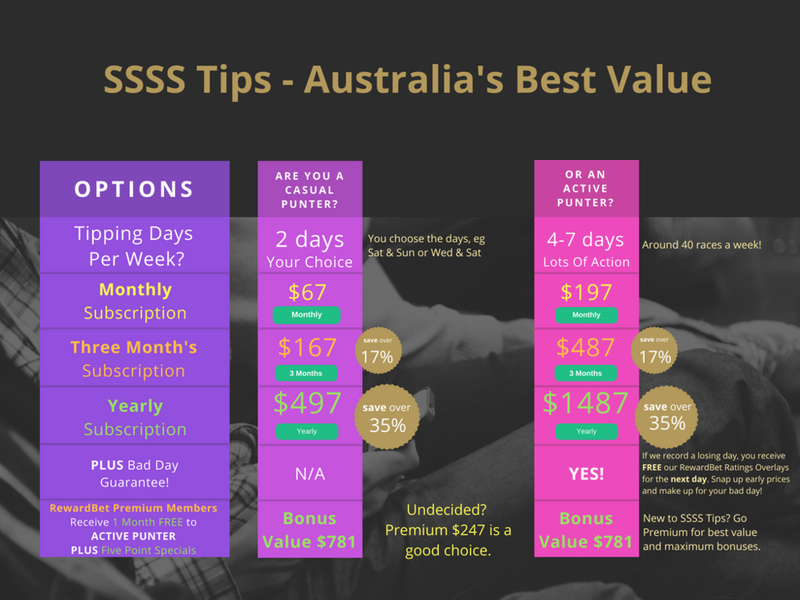 TIP: The Twelve Months ACTIVE PUNTER PLAN is by far our best value and is an outstanding package to put you on the path to better punting. Want a FREE MONTH? Join Premium. Find Out More.